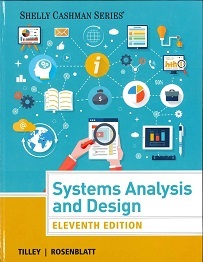 ​Business Analysis and Systems Design is the study of concepts, processes and tools that professionals use to plan and develop computer information systems to industry standards. COMP 2831 continues the established Systems Analysis tradition and provides the foundation for all BCIT Computing development credentials. Students learn how to ask implicit questions, to create and document communication plans and to make better decisions prior to creating an information system. Beginning with an introduction to the SDLC, Software Development Life Cycle, students work in teams to initiate the system process, analyze problems, discover requirements and create a logical design. Topics include: techniques used in the discovery of business requirements, traditional approaches to data and process modelling. There is an overview of Object Oriented Modelling techniques using the Unified Modelling Language (UML) as well as an introduction to Project Management. Agile frameworks including XP, Extreme Programming, and SCRUM are also introduced. Students learn to work in groups to provide detailed written materials and make presentations of their designs. By the end of this course, successful participants will be able to use industry standard tools and methods to analyze, design, and implement information systems. This course is deemed equivalent to the full-time diploma courses COMP1712 and ACIT2831 Students who complete COMP 2831 will be prepared to move on to COMP 2833 Agile Software Development with Scrum and the Agile Development Associate Certificate. COMP 1630 or COMP 1409 or equivalent knowledge, plus the ability to work in groups and to communicate in business English. Course is 48 hours - 36 in class and 12 online. This course consists of one face to face meeting each week, plus an online component and homework outside of class. Attendance and group work are mandatory. One seat remaining as of Apr 19, 2019 1:49 pm PDT. Seats remaining may change at any time prior to registration and payment. Course is 48 hours - 36 in class and 12 online. This course consists of one face to face meeting each week, plus an online component and homework outside of class. Attendance and group work are mandatory. No class April 22 (Easter), May 20 (Victoria Day) or July 1 (Canada Day). This course offering is in progress. Please check this page for other currently available offerings, subscribe to receive email updates or contact us with your comments or questions. This course offering is in progress and full. Please check this page for other currently available offerings, subscribe to receive email updates or contact us with your comments or questions. Course is 48 hours - 36 in class and 12 online. This course consists of one face to face meeting each week, plus an online component and home work outside of class. Attendance and group work are mandatory. Explain and use the various phases of the SDLC, (Software Development Life Cycle). Describe some of the key features in current trends in system development: RAD, RUP, Agile & BPM, Business Process Management. Explain the term "Agile Software Development". Discover and define system requirements using the appropriate technique(s). Develop use case diagrams and scenario descriptions. Read, interpret and develop models that can be incorporated with Business Process Management. Explain how Use Case Modelling and WorkFlow Analysis work together to define functional system requirements. Develop a project schedule using PERT and GANTT charts. Construct a cost benefit analysis to determine the feasibility of a project. Identify and analyze the data entities and objects needed in a system using both Information Engineering and OO techniques with UML. Design a technical architecture system "blueprint". Design appropriate user interfaces following Human Engineering design principles. Identify the required integrity controls for inputs, outputs, data and processing. Describe implementation and support activities. Identify appropriate formats for system documentation. Prepare and present a system proposal in a team environment. Interested in being notified about future offerings of COMP 2831 - Business Analysis and Systems Design? If so, fill out the information below and we'll notify you by email when courses for each new term are displayed here.